Does the name Sterling Moore ring a bell? It should. Moore was somewhat of a Patriots hero in 2011-12. He was the cornerback responsible for knocking what would've been the game-winning touchdown out of Baltimore Ravens wide receiver Lee Evans' hands in the waning seconds of the AFC Championship Game that year. (Sorry for the poor video quality). After that play, Moore came to the rescue again by batting away a pass on 3rd-and-1 that forced the Ravens to try and tie the game to send it to overtime. What happened next is still one of my favorite moments in Patriots history, and also one of my favorite calls by CBS play-by-play man Jim Nantz. Many overlooked Moore's play simply because of Billy Cundiff's missed kick, which is still unfathomable to me to this day. 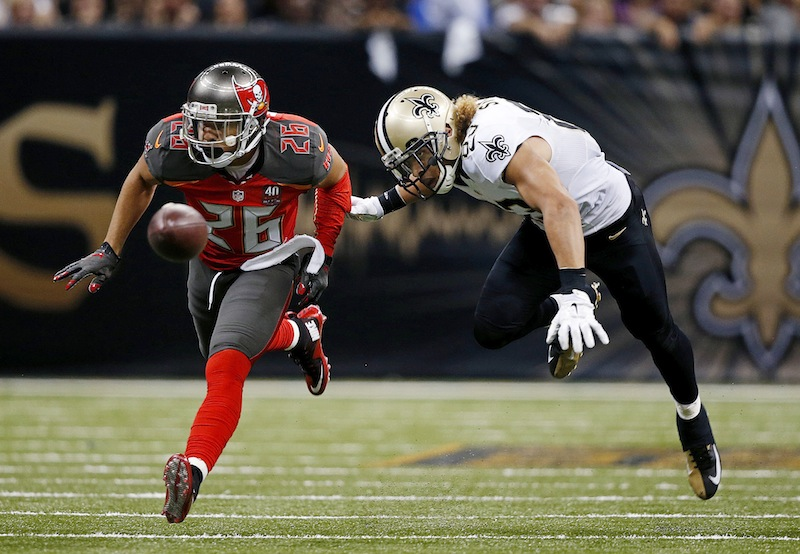 Anyway, after a two-year stint with Dallas from 2012-14, Moore signed with the Tampa Bay Buccaneers in hopes of adding some depth to their secondary. Moore has not only provided that depth, but he's emerged as the team's top cornerback. The fifth-year corner out of SMU has elevated his play to become the team's top cornerback and has been holding his own against top receivers since being inserted into the starting lineup against the New York Giants five games ago. Giants star Odell Beckham Jr. had nine catches for 105 yards against Tampa Bay, but he was targeted 17 times. Moore didn't cover Beckham solely but did finish the game with an interception, three pass breakups and a forced fumble. Moore helped hold Dallas' Dez Bryant to five catches and 45 yards the next week. Moore and the Bucs' secondary struggled against Indianapolis' receivers in Week 12, but Moore rebounded against Julio Jones on Sunday. While Jones did have eight catches (17 targets) for 93 yards, Moore had five tackles and two pass breakups and helped hold Jones to just one catch in the second half. It's a nice story to see how far Moore has come. Moore is only 25 with some room to grow. Sort of reminds you of Malcolm Butler in a small way, doesn't it?